Desperation isn’t a preferred or pleasant condition, but it’s the stuff that miracles are made of. When I looked closely, I saw a pattern in the miracle stories. Right before each miracle, there was desperation: a person or group of people who were at the end of their rope and had no hope unless Jesus stepped in to fix their situation. Miracles are for desperate people. If you’re not desperate, why would you need a miracle? In each miracle story, someone comes to the end of available choices—running out of ideas, options, strength, and resources—and Jesus steps in to make things right. Desperation always precedes a miracle. I found that I had been so busy focusing on Jesus in these stories—perhaps the way one watches a magician carefully to figure out how he’s doing the trick—that I had missed the other half of the equation completely: the someone that the miracle was for. And that someone was desperate. Think about it: someone is blind, or lame, or dead. Someone’s child is sick, or dying, or demon possessed. Thousands of people are hungry, and there’s not enough to feed them. A boat full of people is about to capsize. Ten people are walking around with leprosy, outcast from their families and community. A woman is bent over. A man’s hand is withered beyond recognition. A woman has been bleeding for twelve years. A child is dead. Jesus is the miracle worker of those in despair, the Savior of desperate people. What I discovered was a new way of looking at God’s glory. What if the glory of God is not just about the majestic, powerful acts that draw our attention but also about the specific people and situations God uses that power to help—which also cultivate our belief? This phenomenon of God’s special attention for those at the bottom rung of society isn’t limited to the miracle accounts. Again and again in Scripture God turns the tables on our understanding of what it means to be blessed by God. When we say, “I am so blessed,” we usually mean a state of prosperity, health, and comfort. But reading the Sermon on the Mount turns this upside down. In this amazing teaching in Matthew 5, Jesus rattles off a list of the types of people He sees as blessed, which we have come to call the Beatitudes. Instead of the prosperous and comfortable, we find a whole different kind of blessedness. In God’s economy, the poor in spirit, those in mourning, the meek, the persecuted, and those who are insulted and falsely accused are blessed. Even the celebrated “Blessed are the peacemakers,” which is so often quoted from this list, means that those who are blessed to make peace actually are those who find themselves at the center of conflict, struggle, and war. Desperation is a gift from God because it teaches us we can’t do this on our own. Every time we say to ourselves, “I can make it on my own,” we are fooling ourselves, wearing a mask of self-reliance and believing a lie of self-subsistence. We’re all, every one of us, badly in need of Jesus’ help, but the truth is that it’s only the desperate who go looking for it. And they are the ones who receive. Desperation is the gift of not being able to pretend anymore. It’s the hard things that send us running into God’s open arms. Your desperation is a gift if you’ll let it be. Don’t try to hide the places of your weakness, of dryness, of running out. Don’t run from these things. Lean into them. This is where you’re going to meet Jesus. Your best will always run out. His best will always be better. This is the economy of miracles – of grace – of running out and running to Jesus. This is an excerpt the Rev. 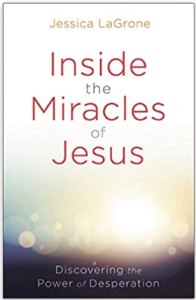 Jessica LaGrone’s latest book, Inside the Miracles of Jesus: Discovering the Power of Desperation (Abingdon Press). LaGrone is the Dean of Chapel at Asbury Theological Seminary in Wilmore, Kentucky, an ordained elder in the United Methodist Church, and a member of the Wesleyan Covenant Association’s Global Council. Her books and Bible studies include Namesake, Broken and Blessed, and Set Apart.